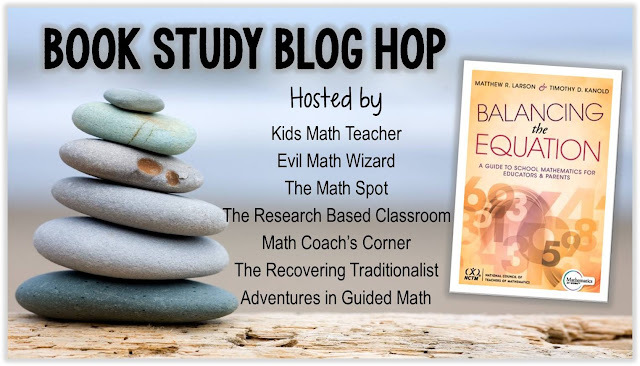 I'm happy to introduce you to the start of a 8-day book study blog hop on the new book--Balancing the Equation: A Guide to School Mathematics for Educators & Parents by Matthew R. Larson & Timothy D. Kanold. If you look at the schedule above you can see the Table of Contents pretty well. This little 124 page book is chalk full of info and guidance for educators, parents, and anyone interested in children's math education! Within the Table of Contents are a very detailed breakdown of every couple of pages so you can easily flip to the section you are looking for. The authors of Balancing the Equation are not new to the mathematics education realm whatsoever. Matthew R. Larson, PhD is an award winning educator and currently is the president of the National Council of Teachers of Mathematics (NCTM). He was the K-12 Mathematics curriculum specialist for Lincoln Public Schools in Nebraska for more than twenty years. He is a frequent keynote speaker at U.S. and state mathematics meetings. Timothy D. Kanold, PhD is also an award winning educator, author, and consultant. He currently serves as the director of Mathematics at Work™, a K-12 school improvement program. He is also a past president of the National Council of Supervisors of Mathematics (NCSM) and had coauthored several award-winning mathematics textbooks since the late 1980s. Here is Dr. Larson speaking at the NCTM 2016 Annual Meeting and Exposition in San Francisco. You can tell how passionate he is about math education. The Introduction to the book starts off with the word equilibrium and its definition-- A state in which opposing forces or influences are balanced. It then goes on to state how much they love math and the students that are learning it. We all want what is best for the students and we all want to see them succeed. It is difficult for the authors to see how much K-12 mathematics education has been under attack. They then go on to explain that this book is meant to be for any and all educators responsible for K-12 mathematics education as well as parents, grandparents, and anyone involved in students success in mathematics. Both these groups can effectively use this book whether it helps to understand the outcomes and instructional strategies for math learning or the reading of this book may deepen the understanding of mathematics education and what is taking place in schools. The main purpose of the book started out to clarify misunderstandings regarding the Common Core State Standards (CCSS) but it became more than that for the authors. They want to "ensure that the hope and promise for improving K-12 mathematics teaching and learning, which characterized the first few years after 2010, is not lost on students." They state that the math curricula in the 1980s and 1990s with respect to instructional approach, content, and assessment practices failed to represent the needed state of equilibrium and as a result, "consistently failed to serve students well enough." Equilibrium in mathematics education that has balanced the equation is an instructional approach that blends procedural fluency, conceptual understanding, and problem solving--thus students learn how to do math, why math works, and when to apply it. The authors want to provide accurate information to help with the following. Explain why we need to raise expectations for effective teaching and learning of math immediately. Show how math education debates have only made a constant disequilibrium and dysfunction toward successful teaching of K-12 mathematics. Explain why parents must support effective math teaching and learning for their children in this Common Core reform era. Outline how educators and parents can help their child successfully learn mathematics and offer actions to take. Throughout the book they will be giving peer-reviewed research to stay away from mere opinions and misunderstandings. Thus, they will be giving facts to support their statements. The book seems to be divided well for anyone who wants to learn more about mathematics education. Part I consists of chapters 1-3 which is primarily geared towards educators and then Part II has chapters 4 and 5 for parents and the expectations they should advocate for K-12 math teaching and learning in school. The epilogue was written to both educators and parents and offers the authors' reflection why mathematics education must change and why it is so challenging to implement. Although, they reassure that efforts educators and parents make can result in better learning opportunities for students. I feel the messages and purpose of this book are sincere and Dr. Larson and Dr. Kanold are coming to us with facts and information that should not be overlooked. Many people in the general public have been misinformed about mathematics education and it is time to work together and help children understand the the how, why, and when of mathematics. Tomorrow please continue on our book study blog hop with Evil Math Wizard and Chapter 1. We want to hear your voice about math education. In my life great math teachers have made a world of difference and the positive attitudes of adults as I grew up helped my love for math.